SWINY is delighted to invite you to a very special evening on Monday, October 22, starting at 5 p.m. 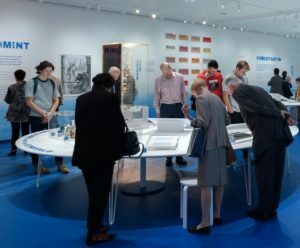 It begins with a private, customized hour-long tour of a major new exhibit, Germ City, at the Museum of the City of New York. This major news-making exhibition details the complex and fascinating interdynamics between infectious diseases and epidemics in New York City. The large, comprehensive show integrates a mix of digital interactive displays, historical artifacts and contemporary artworks to show how diseases, such as tuberculosis and the infamous Influenza Pandemic of 1918, powerfully affected our city in ways few of us realize. Take the “No Spitting” signs in the subway and around the city. They date back to the days when tuberculosis ran rampant in New York City’s poorest, crowded neighborhoods. That’s among the little-known facts you’ll discover as you explore the show with our guide Anne Garner, curator of Rare Books at the New York Academy of Medicine and co-curator for Germ City. Our private tour of Germ City is free for SWINY members, $5 for non-members. SWINY’s board looks forward to sharing this exceptional experience with you – then talking about it over a good glass of wine. The tour begins promptly at 5 pm. To be admitted, your name must be on the attendance list. Please register by 6 p.m. on Friday, October 19 to be sure you’re on the list – and able to enter for the tour. a) # 6 train to East 103rd Street. Walk west on 103rd. Cross Park Avenue, turn right, walk a few yards, then turn left onto path through the garden of Carver Houses to Madison Avenue. Continue west on 103rd Street toMCNY. Main entrance is on Fifth Avenue. b) # 2 or 3 train to Central Park North/West 110th Street. Walk one block east along West 110thto Fifth Avenue, then south to 103rd Street. On uptown 2/3, choose last car. Downtown: take first car. Bus: M 1/2/3/4 to East 103 St. Southbound on Fifth Avenue. Northbound on Madison.